Mike Sweeney of FishDuck.com was at the Hatfield-Dowlin complex on Friday covering week one of spring practice for the Ducks where defensive lineman DeForest Buckner talked about his rehabilitation process. It’ll be a long spring for Buckner, the Oregon D-lineman who had arthroscopic surgery performed on his knee over the summer. The crutches have been stowed in the closet, but he’s still rehabbing his knee, unable to participate in spring drills. “I’m taking it easy this spring, getting ready for the fall,” he said. The Ducks will need him for the opener against Eastern Washington on September 5. Last year, Buckner was the second-leading tackler among the down defensive linemen. The Oregon senior takes the obstacle in stride and spends his practices on the sidelines coaching up his teammates. “I try to be as vocal as I can and just help out the guys with their technique.” When asked which defensive linemen have stood out so far, Buckner singled out two seniors, Tui Talia and T.J. Daniel; he was also excited about Canton Kaumatule, a highly regarded 6-foot-7, 295-pound freshman from Honolulu. Buckner said that he’s looking good so far and will be “a big help this year.” With defensive anchor Arik Armestead gone to the National Football League, the Oregon defense will need Buckner and his line mates to step up to fill the gap. 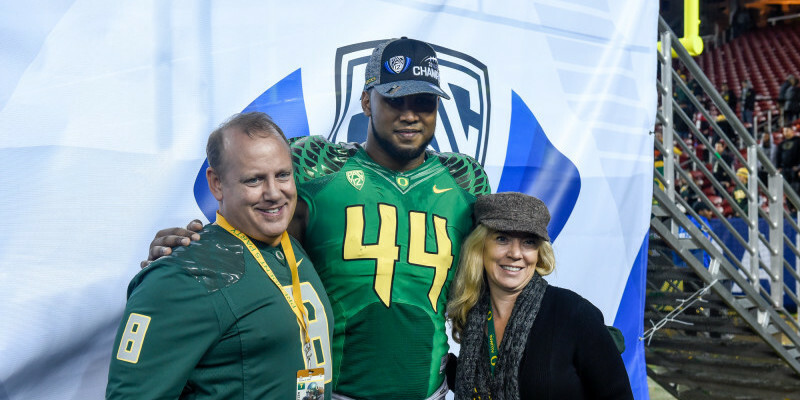 Buckner also thought about heading off to the NFL after the National Championship game, but after discussing the matter with his family he decided to come back for his senior year at Oregon. He said it was a hard decision, but he loves Oregon and thought it would be best to return. Duck fans are glad to have the defensive stalwart back for the 2015 season. They’re counting on him for another run to the National Championship playoffs.